Looking out at the isolation precautions sign, gowns and gloves hung up on the door to my ER room. One of my favorite types of science fiction and fantasy stories is that about epidemics. The tales of a heroine racing against time to prevent an outbreak of an infectious disease from taking down a community are thrilling nail-biters and I have a hard time tearing myself away before I know how everything turns out. But, the thing is, even if it's in a magical world, the details have to be believable or I just can't get lost in the story. If I, as the audience, become suddenly aware of an oversight or glaring flaw in the story's internal logic, then I'm no longer engrossed. So, what details can a writer include to help create a believable epidemic that keeps the audience engaged? Well, I've got a few firsthand tips that can help. Some of you may have noticed I haven't been around much since Thanksgiving. It's because I've been sick, like, really sick. Since November 23, I have had the flu, bronchitis, and at the beginning of this year, I spent two days in the hospital with an extreme case of the stomach flu. It's been a tough few months. I had no idea it was viral gastroenteritis when I woke up violently ill on January 1, I just knew I desperately needed to get to the emergency room for help. I'll spare you the gory details and, instead, skip to the part where things started to get even worse in the hospital. I had been in the ER for several hours on an IV and anti-nausea medication when I got a whole lot sicker. Suddenly, the staff changed my ER room into an isolation unit. I cried. I had no idea what was happening and I was frightened I may have exposed my family to what was making me so sick. On Facebook, my friend Anne suggested I start looking for blogging inspiration to keep my mind off of how scary the whole thing was becoming. OK, sure. I wasn't in a bubble with my alien friend but it was still pretty scary. I instantly thought of Chelsea Mueller's excellent Krav Maga for Writers series. 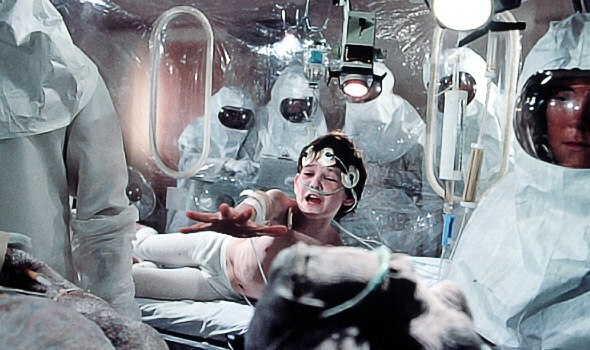 It wouldn't be so terrifying if I tried to view the whole experience as Patient Zero field research. So, I began to mentally catalogue all I could learn from the whole affair and it boils down to these three tips for would-be epidemic writers. 1. 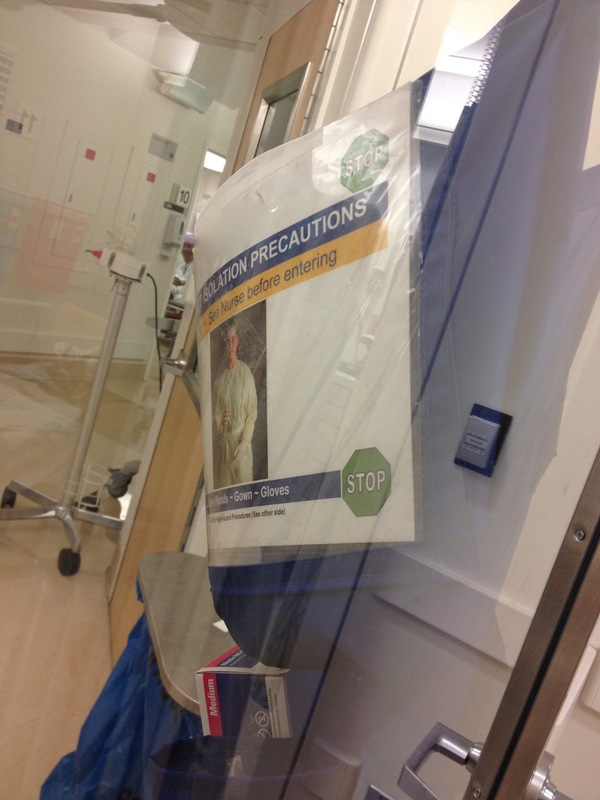 Nurses are the unsung heroes in a Patient Zero situation. Doctors and scientists seem to get all the credit in the epidemic sub genre. They're the ones with the brilliant flash of inspiration or dogged determination that leads to a cure. But what about the nurses? They're the ones who realize something isn't right with Patient Zero. In my case, my nurses were the first to notice I wasn't progressing as I should. The medicine and (at that point) three bags of saline administered weren't doing the trick. My nurses were the ones who called the resident and attending doctors, insisting that my situation was changing and I needed to be reevaluated. The great care I received hammered home the fact that nurses are the ground troops in an epidemic. Those hardworking women and men make for compelling characters and their interpersonal relationships with doctors can add intrigue to a story. 2. Overheard conversations are the perfect place for exposition. There's not much to distract Patient Zero when she's laying on a gurney getting sicker so she's going to listen to the conversations between the medical staff. This is the perfect time to clue the audience in to what's happening. Even though this is a jargon filled conversation between two or more professionals, there's no need to dumb down the exchange. If there is a point you want to make sure your audience understands, Patient Zero can always ask for clarification. For example, when I was wheeled out of the ER to my room for the night, I overheard a nurse asking for a high clean. I had no idea what that meant so I asked. The technician explained a crew would come in and wash down everything in my isolation unit, including the walls to prevent the spread of whatever I had. Patient Zero's unfamiliarity with the situation is a great opportunity for a writer. What not to watch on your phone while violently ill in the emergency room. 3. Being unable to account for all variables in an epidemic adds to the drama. Even if your epidemic has something to do with magic, your communicable disease can spread normally (through the air, physical contact, blood transfusion, etc.) and your equivalent to public health officials and medical staff can't clean up all infected sources. Something is bound to slip through the cracks. Before I was admitted, I lay slumped in a chair with my head propped up against the wall. If viral gastroenteritis spread through, let's say, sweat, I could have left it for the next person to touch the wall. The inability for staff to account for all of my actions could mean the virus lurks in forgotten corners. Unknowns like this are an excellent chance to tease your audience with the idea that other characters are coming dangerously close to becoming infected. Well, there you have it. Being a would-be Patient Zero is something I never ever want to experience again but I wouldn't mind reading a fictionalized account in a new Urban Fantasy. Have any questions or need a clarification? Ask away in the comments and I'll do my best to answer them. I cannot every agree enough with how awesome nurses are. Had an ER stay a bit ago - they were so kind I wanted to sob.